It might not be easy to explain why I became so fascinated with Woody Guthrie in the first place. He might be Dylan before Bob Dylan, the original hobo musician riding empty cargo trains across the US, but it doesn't really explain why I (and apparently many other people) are drawn to his music and life. One of Guthrie's friends wonders out loud at the end of the biography why people most often ask him about Woody and not the other, even more brilliant, musicians he worked with. Its a small mystery, one that is not completely understood through this otherwise solid piece. Most people might not have heard the name of Woody Guthrie, but most likely know him by reputation. Remember those cartoons of a ragged traveller hopping trains through rural America? A fiddle or a mandolin strapped around his back and a bag of possessions hung on a stick over his shoulder. That is essentially who Woody Guthrie was at one point in his life and somehow that character has entered the national consciousness of western countries, especially the United States. In addition to that travelling hillbilly, Woody was many things. An avid reader of just about anything, a brilliant (but not very productive) writer of novels, a painter of storefront signs and a communist. A small man that could charm his way through any situation, but also a capricious and callous man. His family dispersed around the country in the dust bowl era, with only his first wife staying behind in Oklahoma. All of this is a wonderful story not only because Woody is such a fascinating persona, but also because his story is as much the story of the birth of modern day America. For the most part, Klein does a decent job with the vast amount of material. 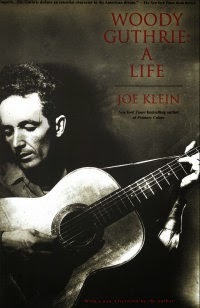 Woody Guthrie: A Life is somewhere between a facts-only biography and a memoir, but it does sometimes become somewhat tedious to read. Because Klein wants to keep things historically accurate, he is unable to bring enough color to some secondary characters. This is most likely because not that much is known of the many people that entered and promptly exited Woody's life.